The expression (1 + r)t is sometimes referred to as the future value interest factor for $1 invested at r percent for t periods of time. 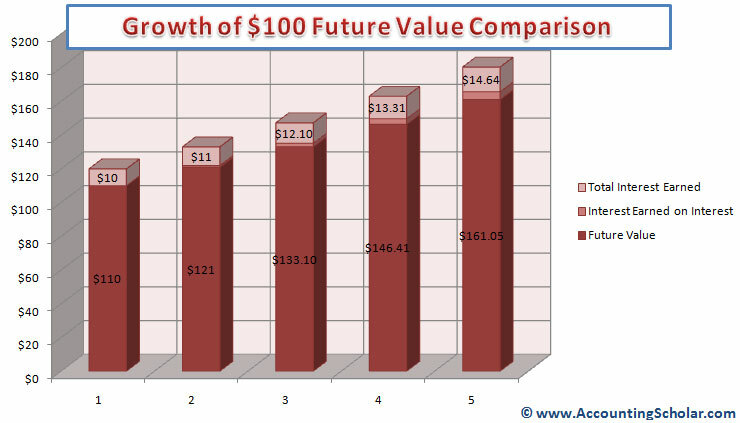 Let’s use this future value formula to derive the original $121 at the end of the 2nd year. What would be $100 worth in 5 years, at a 10% interest rate? The above graph shows the growth of $100 from inception at year 1 earning simple interest of $10 (10%) and earning $11 in the 2nd year, thus making the new total compounded earnings to $21 at the end of year 2. This compounding effect continues to year 5 when the money has grown from $100 to $161.05 in Year 5. Consider you found an investment that pays 15% annual interest, which sounds fantastic to you! This makes you invest $1000 in to it, how much will you have in 3 years? How much will you have in 7 years? And at the end of 7 years, how much interest will you have earned, and how much of it will be compounding interest? Note: We recommend you try this problem without looking at the solution below first, however if you get stuck, feel free to take a peak!